A trio of Florida men have been charged with running an elaborate free vacation scheme in the "Happiest Place on Earth," Disney World. 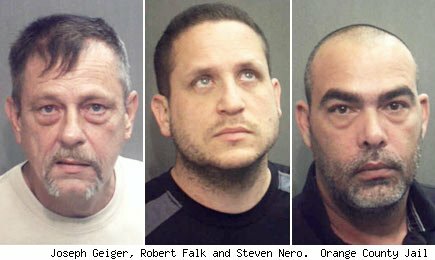 Officials told WFTVJoseph Geiger, Robert Falk and Steven Nero allegedly spent four years living off the land in Mickey Mouse's backyard, racking up as much as $15,000 in hotel charges in one month alone. They managed to pull off the scheme four years in a row by taking advantage of the park's reservation system loopholes. "Investigators found that the men would book hotel rooms with one credit card and then put down a second, pre-paid debit card with only a $1 or $2 on it to cover any charges to the room. They would then go out in the parks, bill everything to the room and take off before the charges caught up and employees found out," according to WFTV. What's not clear is whether the credit cards they used were fraudulent or stolen as well. The jig was up when a cigar shop worker tipped off the theme park's authorities, which called in law enforcement.